Knowing where coffee comes from is important, but it’s only one piece of the whole process. Here, you’ll learn how we grow, harvest, process, ship, store, blend, and roast coffee beans. Join us on the six-month journey from the country of origin, to our roaster, to your coffee cup. From bean to cup, a coffee’s aromas and flavours are shaped by an incredible journey that begins with how it’s grown and ends with that magical first sip. Coffee beans start with coffee cherries that grow on trees. The two main commercially grown coffee varieties are Arabica and Robusta beans. Arabica beans are considered superior due to the extended time it takes for the coffee cherries to mature at higher elevations and the fine cup characteristics these beans produce. The oval shaped beans have a higher lipid and sugar content, which contributes to a better taste. At Canterbury Coffee, we only purchase 100% Arabica coffee beans. Robusta beans are another popular variety, which are circular in shape and are mainly cultivated in West Africa and Southeast Asia. Robusta trees are hearty plants that grow at lower altitudes (sea level to about 600m) and Robusta beans make up 75% of the world’s coffee production. Growing and nurturing coffee plants requires a temperate climate that is frost-free, has moderate rainfall, mist, overcast skies that diffuse sunlight, and fertile soil (volcanic is ideal). Combine these conditions with high elevation and a shady tropical canopy and you have the optimal environment to grow premium coffee cherries. Typically, the most suitable coffee growing regions in the world lie between the Tropic of Cancer and Tropic of Capricorn. Some of the larger producers of coffee cherries are Brazil, Vietnam, Colombia, and Indonesia, but many countries in Asia, Africa, Central America, and South America also produce coffee beans. 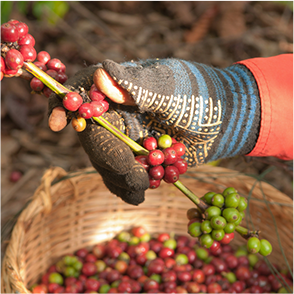 There are three ways to pick coffee cherries. Hand picking is the most expensive method because it requires workers to walk between the trees and selectively pick cherries at the peak of maturity. Although this is a more expensive method, it means that only ripe, high-quality berries are chosen. Strip picking is also done by hand but, with one sweep, both ripe and unripe berries fall to the ground and are harvested from the piles of leaves and twigs below. Mechanical harvesting is the method of choice for large commercial operations. In this case, machines are used to shake the berries from the tree. As a coffee cherry ripens, its outer skin turns from green to red. When they are picked and processed, the cherries are stripped of their skin, their pulp, and a coating underneath the pulp called the parchment. What’s left is the coffee bean, which is covered in silverskin – a thin layer that may or may not be left intact for roasting. The two methods commonly used to process coffee involve either washing or drying the cherries. The availability of fresh water is usually the determining factor between them. In the washing process, cherries are put into large tanks of water. The ripe ones sink, while the unripe cherries float. Afterwards, the ripe cherries are pulped and fermented, which loosens the mucilage so it can be separated from the bean. The fermentation process also helps to further enhance the characteristics of the coffee’s aroma and flavour. After being washed, the cherries are dried in the sun or by mechanical means. When cherries are processed using the dry method, they are left in the sun for several weeks until they are shrivelled and dry. At this point they are dry milled to remove the fruit from the bean. After being stored, typically with the parchment still on, coffee beans are then prepared through a milling process; this removes the parchment entirely. The final step is to sort and remove all defective beans. The highest quality beans are packed into burlap bags and prepared for shipment, taking around two months to travel from the country of origin to the destination. When the coffee arrives at the roaster, our Roastmaster samples the beans and examines each new shipment. He begins a process of cupping the coffee to ensure the quality and flavour of the beans. With his seal of approval, the sacks of coffee are brought into our warehouse. 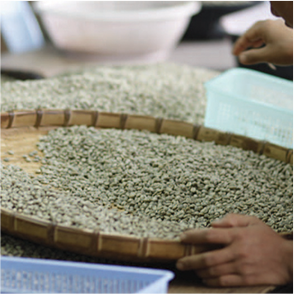 Stringent systems ensure that organic and fair trade coffees are kept separate. Blending coffee is similar to mixing spices to achieve a great tasting dish. Although some coffees are great as a single origin, others benefit from being blended to bring out the coffee’s best characteristics. Our Roastmaster skillfully and carefully blends beans to create a coffee profile. Some of our signature blends include Blues Blend, Kodiak® and Shaughnessy Estate®. There are two strategies for blending beans. The Blend Before Roasting (BBR) method uses green, unroasted beans from different origins and subjects them all to the same degree of roasting. The Blend After Roasting (BAR) method incorporates beans from different roast levels into the finished blend, producing a very complex cup. Green or unroasted coffee beans contain starches, proteins and caffeine, but lack flavour. With a controlled application of heat, the colour, taste, smell and density of the bean is transformed. 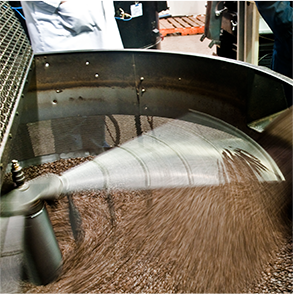 The entire roasting process takes roughly 13-18 minutes, exposing the beans to temperatures of around 400 - 460°F. Once the desired roast colour is achieved, the beans must be quickly cooled (quenched) to stop them from roasting any further and to lock in their finished roast colour. The flavour of a coffee will change dramatically, depending on the degree of the roast. The longer the process and the higher the temperature, the darker and stronger the resulting finished coffee will be. This process also converts natural starches into sugars and reduces the coffee’s natural acidity. After roasting, the finished beans are randomly sampled to test for quality and approved batches are then packaged and shipped out. It's a long journey from the farm to your cup, so make it worthwhile by ensuring you brew your coffee to taste its best. Read our recommendations for optimum brewing techniques.